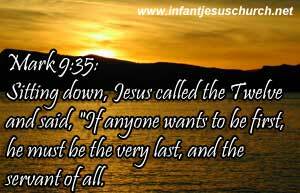 Mark 9:35: Sitting down, Jesus called the Twelve and said, "If anyone wants to be first, he must be the very last, and the servant of all. If any man desire to be first, the same shall be last of all, and servant of all-that is, "let him be" such. Here the meaning is he must be prepared to take the last and lowest place. I don't think anyone in this world likes to be last. I have a hard enough time settling for second place, much less last place. Jesus reverses entirely the rank. The person who is most important to him is not the person seeking the status and notoriety. The most important person is like Jesus himself, willing to give up rank and status and importance to serve. For HIM, last means first in service or the neighbour and the world and first in the eyes of God. Heavenly Father, you have made the world wonderful for us and have given your Son to redeem us. How can we ever thank you or repay you for your grace and kindness? Help us to serve others with grace and kindness. Give us eyes to see people as you do, not judging by mere appearances, but valuing, serving, and treating people as You did. We pray in the name of Infant Jesus, Amen. I ask everyone's prayer for my friend whose brain is serious affected by cancer and admitted in the NIMHANS hospital.